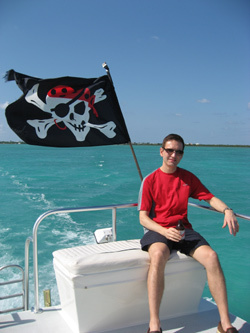 Terry Wilson, originally from Tampa, and has lived in Grand Cayman for 24 years. 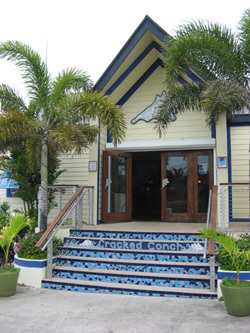 His company, Wilson Construction, has built many homes and commercial buildings on the island, and over the years Terry has done a variety of decorative concrete projects, ranging from the floor of the Cracked Conch restaurant, to a cast in place bar top for his own home. 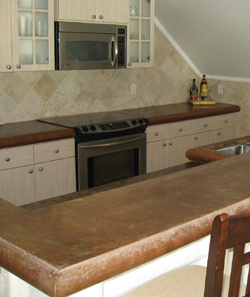 Terry started getting more requests for high end concrete countertops, and in October 2010 he attended The Concrete Countertop Institute’s 5-day class. In December, he brought me (Jeff Girard) down over Christmas to help him with his first big project. What a project, and what a setting! 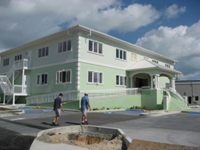 The building is a new office for Thompson Shipping, who also owns a concrete batch plant and aggregate company. 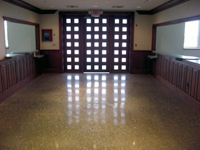 Thompson wanted to showcase their aggregate and logo in long, dramatic counters in the reception area of the building. There are many more photos of the entire creation process on the CCI Facebook page, as well as photos of the fun that Terry, my wife Lane and I had while not working on concrete. 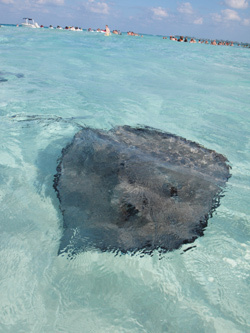 We snorkeled, swam with stingrays, sampled great food and Caymanian hospitality, and enjoyed gorgeous beaches. This is what I love about the concrete countertop industry. So many people in all sorts of places around the world are creating amazing works of art that work in their setting. Whether it’s clean lines celebrating Scandanavian design in Finland or exposed aggregate celebrating local materials in the Cayman Islands, concrete countertops everywhere are bringing uniqueness, personalization and craftsmanship back to the building process. If you have a “concrete countertops around the world” story, let me know. Where are all my readers from?